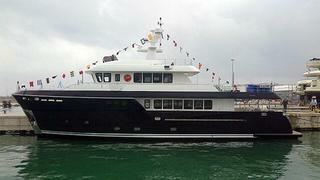 Cantiere dell Marche has launched their new flagship this weekend, the 28.95m explorer yacht Stella di Mare. Stella di Mare is the first hull from the Darwin 96 series. Built in steel and aluminium, this pocket explorer yacht is designed by Sergio Cutolo of Hydro Tec, while her contemporary interior is by Pierluigi Floris and Marco Veglia. Compared to the previous Darwin yachts produced by Cantiere delle Marche, all decks have been increased and optimized. On the lower deck for example, she offers more space for the full-beam master and the VIP, which now have equal sizes. Note also that Stella di Mare was created to be often helmed by the owner himself, and the bridge deck was modified to create a large social area to enjoy cruises with friends and family. Stella di Mare is powered by twin 720kW MTU engines, giving a top speed of 13.5 knots. When delivered, she will extensively cruise the Mediterranean, and her range (over 5,000 nautical miles at 10 knots) will give her the possibility to cross the Atlantic Ocean. Stella di Mare will make her debut at the next Cannes Boat Show in September.